In Tyendinaga Mohawk Territory almost 200 years ago the first settlers clear-cut the land to start farms. The Eastern Cedar they cleared at that time is what we use today for our “Ancient Flutes.” The aging process brings out a rich & dark colour of the wood. Although we try to have a reasonable stock available, most flutes are custom made by order and could take from 2 to 6 weeks to complete. Look through the choices below and let us know which Eagle Wind Native American Flute is right for you. If you don’t see exactly what you want please contact us to schedule a free consultation where we can design a custom flute built to your exact specifications. All charges will be in Canadian dollars. After you order a flute, we will contact you to confirm your order and finalize shipping costs and details. Made of Sitka Spruce, Yellow Cedar or Red Cedar. If you don’t see exactly what you want above, we can design a custom flute built to your specifications. 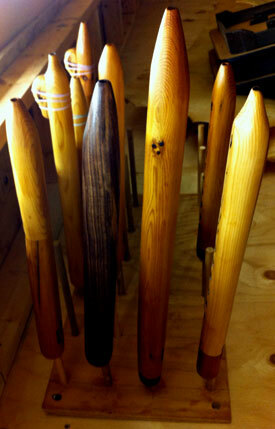 On custom flutes we can blend wood types and the block can be made from different types of wood in various styles. 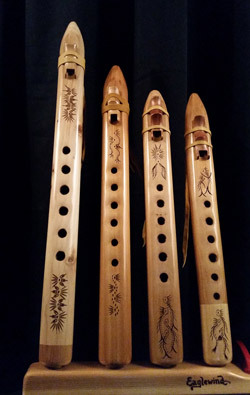 There are many options to choose from in a custom flute. Contact us for a free consultation and pricing.